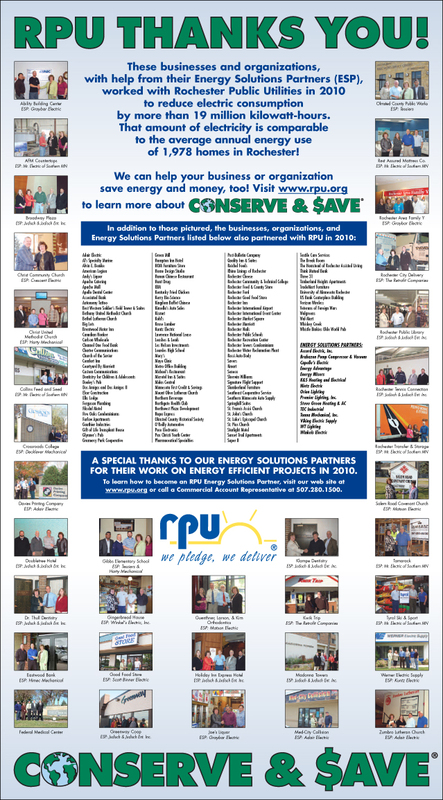 RPU works with customers to conserve over 19 million kilowatt-hours! By working with customers on energy conservation and energy efficiency, RPU was able to reduce electric consumption in 2010 by over 19 million kilowatt-hours. That amount of energy is equivalent to the annual household usage of 1,978 homes in Rochester. 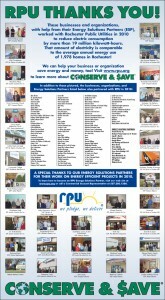 In celebration of this collaborative effort, we have produced a full page newspaper ad highlighting local businesses and organizations that made energy efficient changes in their operations. The newspaper ad will run in the local newspaper on Saturday, January 29. Thank you to all of our customers and energy solutions partners for their effort this year! 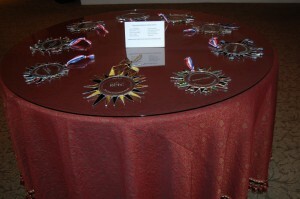 All nine of the individuals and organizations were on hand to receive their 2010 Environmental Achievement Award at an award dinner last night. Thank you to everyone for coming out for this beautiful event! Rochester Public Utilities (RPU) and the Olmsted County Environmental Commission announce the recipients of the 2010 Environmental Achievement Awards. The recipients will be recognized at an awards banquet on January 27 at the Rochester Golf and Country Club. The awards honor individuals, organizations, schools and businesses that have made a significant contribution in 2010 towards environmental quality in any of the following categories: renewable efforts, conservation, energy, water, agriculture, education, and other. To reduce stormwater runoff volumes and pollution from parking areas, RCTC constructed designed and constructed an “Eco-Lot” in their parking lot expansion on the west side of their facilities. The Eco-Lot, which accommodates all of their stormwater on site,features bioswales, rain gardens, infiltration basins, and native landscaping. The lot is also pedestrian friendly and contains signage that educates students and visitors about the need to manage stormwater runoff and the benefits of the various design features utilized in the Eco-Lot. Under the direction of Roger Larsen and Karen Sabatke, the Regional Science Fair has supported science projects that explore renewable energy, water and energy conservation, pollution prevention, and sustainable resource use. The value of these science projects has been recognized with awards from the Southeast Minnesota Clean Energy Resource Team, Izaak Walton League, and Ricoh Sustainable Development Partner program. Through his volunteer work with Quarry Hill Nature Center, Dave Moehnke has used the monarch butterfly program to help students understand the complexities of ecology. With students, Mr. Moehnke has assisted in monarch larva monitoring research each summer and fall migration studies. Mr. Moehnke has engaged students in real hands-on science, instilling strong science skills and fostering interest in helping researchers as citizen scientists. Lisa Peterson and Don Morrison spearhead the group of citizens and citizen foresters that assisted the Rochester Parks Department in gathering tree data from both public and private lands. Their work will be used to assess the value and vulnerability of the urban forest as well as to develop forest management strategies. Mark St. Peter and Craig Wentworth were instrumental in organizing the Litter Bit Better program in Rochester. Since its initiation 4 years ago, nearly 12,500 volunteers have collected over 50 tons of litter and recyclables. With the support of Mayor Brede, the Rochester Public Works Department, RNeighbors, and others, the program has continued to be very successful in engaging volunteers in an annual city-wide litter clean-up program. Ruthann Yaeger has been a lifelong volunteer in many conservation programs in Olmsted County. Organizations that she is active in include Friends of Oxbow Park, Friends of Chester Woods Park, Zumbro Valley Audubon Society, Minnesota Master Naturalists Program, Prairie Smoke Chapter of The Prairie Enthusiasts, and the Olmsted County Parks Commission. Students at John Marshall undertook a school-wide project to reduce their school’s carbon footprint. This included producing and airing three popular videos, including one on vampire energy. The students also helped secure grant funding to install a cover on the JM pool as a way to conserve energy. In 2010 Mayo clinic installed the largest solar array (462 panels, rated at 145 kW) in Southeastern Minnesota on their Damon Parking garage. On a sunny day, at peak output, the panels provide all the power required for the Damon Ramp (lighting, elevators, heating and cooling of stairwells) and feed excess energy into the electrical grid. In addition to the solar project, three raingardens were constructed to capture and naturally filter water running off of their lawns and parking lots. The attractive and functional raingardens are located in three separate locations on the Mayo Medical Campus providing and each demonstrates for employees and visitors. Mike and Roxanne Schlasner have long been advocates for the preservation and restoration of natural resources in Olmsted County and Southeastern Minnesota. In recent years, they have been active supporters of the protection of the Decorah Edge groundwater recharge areas in Olmsted County and are active volunteers at Oxbow Park and the Weaver Dunes Scientific and Natural Area. “This year’s recipients represent a diverse group of individuals and organizations making a positive impact on the local environment. Through recognition of their efforts, we hope to further awareness and participation in positive environmental efforts in Rochester and Olmsted County.” said Larry Koshire, RPU General Manager. RPU will be closed on Monday, January 17 in observance of Dr. Martin Luther King Jr. Day. Payments can be made on the RPU web site and can be dropped off at a payment drop off location. Have a safe weekend! Four scholarships are available to qualifying high school seniors planning to attend a post-secondary educational institution through the Minnesota Municipal Utility Association. One local essay will qualify for state-wide consideration. All details and guideleines for essay submission are available on the RPU web site. The deadline for essay submission to RPU is April 8, 2011. For specific questions, please contact Tony Benson at 507-280-1534 or tbenson@rpu.org. You are currently browsing the Rochester Public Utilities | Behind the Meter blog archives for January, 2011.